At this time of the year people living in the Northern Hemisphere are starting to prep their gardens for winter and if you live in the countryside many people are harvesting their summer crops. 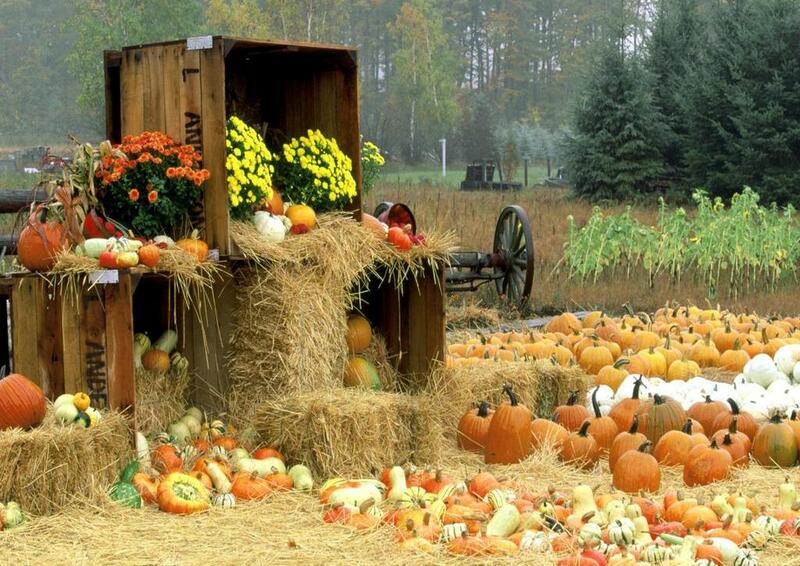 In New England as the days get shorter and the temperatures drop families with young children will often visit one of their local farms and pick their own pumpkins for Halloween. Just writing this brings back great memories of my children when they were young, but there also a different type of harvest that those of us near or in retirement should take part in – definitely not as fun but maybe of lasting value. What I am referring to is tax loss harvesting. Uh, ah I just filed my taxes for last year and now you want me to focus on the dreaded “t” word again? Please allow me to explain. In my life travels I have never met anybody that does not think that they are paying too much in taxes and would love to lower their annual contribution to the government coffers (in a legal way of course). One way of doing this which is pretty straightforward but often ignored is tax loss harvesting. Along with enjoying harvesting pumpkins with your children or grandchildren why not harvest your investment losses as well? After all as we have shown in earlier writings (Leaving Money On The Table) proper tax management of investment portfolios can dramatically alter financial outcomes especially over long periods of time. How does tax loss harvesting work? Tax loss harvesting is an approach to minimizing how much you pay to the government on the (hopefully) gains in your investment portfolio. What it involves is selling those investments where things did not pan out as expected and you incurred losses. You would then offset these losses with the gains that you hopefully have on other investments. A good background read on tax loss harvesting prepared by Fidelity Investments can be found here. While everybody’s circumstances are different let us look at a simple example. Let’s say that at the beginning of the year the Mitchell’s bought a portfolio of Health Care stocks that unfortunately lost 20% of its value resulting in a loss of $10,000. They also luckily bought some energy stocks In January that currently exhibits $15,000 worth of gains. The Mitchell’s are now worried about all the negative publicity surrounding oil surpluses and wish to sell their energy holdings. Doing so would trigger short-term capital gains on which they would have to pay taxes. On the other hand the Mitchell’s think that Health Care stocks will soon rebound after the US Presidential Elections turning their current paper losses into winnings. But just like things do not always work out as expected, tax issues are never straight forward so in order to lower their overall tax bill they would have to sell both their health care and energy investments. Not really what they wanted to do, but a lower tax bill this year would come in handy to pay for that winter getaway vacation to Costa Rica. However, what the Mitchell’s can do is go ahead with both sales, legally offset gains with losses and then buy an essentially “similar” investment in health care stocks. For example if they previously owned a basket of Pfizer, Mylan and Bristol Myers stock which they must now sell they could buy the S&P 500 Health Care Exchange Traded Fund (ticker XLV) as a replacement. From an IRS perspective that is a permissible transaction. So essentially they have maintained the same exposure to health care stocks but lowered their tax bill. Assuming that the Mitchell’s are in the 25% marginal tax bracket they would owe $1,250 to the tax authorities using tax loss harvesting as opposed to owing $3,750 if they had sold their energy holdings and held on to the losing position in health care stocks. And their portfolio is still essentially positioned as they want with a bet that health care stocks will rebound post-election. They just turned lemons into lemonade and are able to save $2,500 in taxes which they can use to travel to their favorite winter spot on Tamarindo Beach in Costa Rica! Simply reducing turnover or matching winning with losing positions once a year yields some gains but leaves a significant part of the potential tax alpha on the table. Tax aware optimization techniques while complicated on the surface are commercially available but require customization to account for individual circumstances. In many instances such programs create voluntary losses to offset current investment gains and the more advanced applications encompass security positions across different asset classes. Feel free to contact us at Global Focus Capital LLC (mailto:eweigel@gf-cap.com or visit our website at https://gf-cap.com to find out more about our asset management strategies, consulting/OCIO solutions, and research subscriptions. Rebalancing is a topic held near and dear to the heart of many investment advisors and often forms a key building block of what the advisor perceives as his or held value add. If diversification is viewed as a free lunch then rebalancing is often viewed as free dessert. Unfortunately while the benefits of true diversification stand the test of time the same cannot be said about rebalancing especially when done in a highly automated way such as frequently seen in many robo-advisor offerings. What do we mean by rebalancing? There are many reasons why investment advisors intentionally shift the weights of their portfolio components over time. The manager may have a changed view on future expected returns or they may deem a certain investment to now possess an unacceptable level of risk and thus wish to cut back on the exposure. Others may wish to more closely track a commercial index and do a wholesale portfolio rebalance to minimize deviations from benchmark weights. In general there are two basic underlying motivations for rebalancing. The first is informational – the weighting structure of the portfolio is consciously changed to reflect an updated perspective on forward-looking estimates of return and/or risk. The second basic motivation for rebalancing is purely driven by an automated rule that is agnostic to changing views on capital market risk and return conditions. The rebalancing rule is followed religiously regardless of the capital market environment. This second form of rebalancing and the focus of this note we refer to as a constant mix strategy. Constant mix strategies take their cue solely from relative asset price changes over a chosen period of time and seek to bring portfolio weights back to a set of pre-defined time-invariant weights. 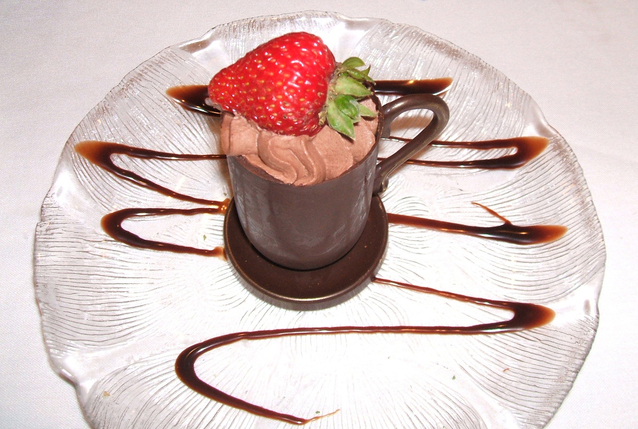 Why are many automatic constant mix rebalancing strategies viewed as a free dessert? Constant mix strategies trim relative winners and top up relative losers. Assuming fairly priced asset classes at the beginning of the period a constant mix rebalancing approach can be construed as a value-oriented strategy buying up cheap assets and selling expensive assets. The working assumption is that capital market forces will correct relative asset class mis-pricings. Under this scenario markets are constantly displaying mean-reverting behavior. Asset classes that go up must come down and vice versa. Kind of a rollercoaster of relative performance. Rebalancing programs will pick up nickels and dimes by selling relatively expensive assets and investing the proceeds into relatively cheap securities. Transaction costs and short-term capital gain taxes will be incurred but according to proponents of such rebalancing programs, such costs will be offset by gains in portfolio values and as a side benefit – the icing on the cake – a reduction in portfolio risk. Risk in this context is frequently equated with downside volatility as valuation changes are viewed as the primary cause of mean reversion in asset prices. The idea of buying low and selling high is alluring and under a mean reverting type of market a constant mix strategy would deliver on the promise. But the romantic notion of mean reverting markets often fades away as real capital market behavior with all of its flaws sets in. Do real capital markets behave in the idealized mean reverting manner necessary for constant mix strategies to shine? Capital markets are ever changing as asset class fundamentals, risk characteristics and investor demand fluctuate for perfectly sensible as well as irrational reasons. Capital markets are constantly calibrating supply and demand conditions and over short-term intervals changes in investor sentiment tend to overpower fundamentals. There is also a lot of both academic as well as practitioner research on time series momentum. In general the conclusion is that over intermediate time frames such as 12 to 24 months there are trends in asset class performance. Mean reversion as a concept has been thought of more as a 3 to 5 year concept but over the typical time periods used in rebalancing programs (monthly or quarterly) the evidence is more consistent with trends in asset class prices. Apart from taking advantage of mean reversion patterns in asset class performance how does rebalancing really work? In a recent paper titled Rebalancing Risk, Granger, Greenig, Harvey, Rattray and Zou derive analytical formulas as well as provide empirical evidence on the behavior of constant mix strategies versus an approach that allows asset class weights to drift depending on relative performance. The constant mix strategy carries negative convexity meaning that it outperforms when asset class return divergences are small by collecting the premium received for selling the puts and calls on the underlying portfolio. However, when asset return divergences are large the selling of puts and calls results in losses and the buy and hold portfolio out-performs. In extreme cases when one asset class significantly lags the rest of the portfolio such as in a stock market crash the negative convexity of the strategy can magnify the drawdown. Another way to think of the constant mix strategy is to put yourself in the shoes of the investor selling puts and calls. When volatility rises holders of the options will benefit and commensurately sellers of options will see an economic loss. That is why the constant mix rebalancing approach is often described as a short volatility strategy. The authors of Rebalancing Risk conduct a set of empirical and simulation exercises using US stock and bond data. What do they find? Constant mix portfolios exhibit small positive returns when relative asset class performance (stocks versus bonds in this example) do not perform too differently from each other. When there are large differences in asset returns the tendency is to exhibit losses relative to buy and hold portfolios. The losses are magnified during periods of extreme relative performance. The basic prerequisite for constant mix strategies to out-perform buy and hold strategies are reversals in asset class performance. From a risk perspective, constant mix strategies add an element of risk as the approach involves additional option related features. Justifying the use of a constant mix approach by implying risk reduction benefits is theoretically and empirically unfounded. Access the full report here That Free Rebalancing Dessert Can be Costly! What’s more important to investors than real returns? In a previous note (Leaving Money on the Table) we wrote about the impact of taxes and fees on net strategy returns. Our focus was more conceptual and we highlighted the highly customized nature of after-tax portfolio management advice. 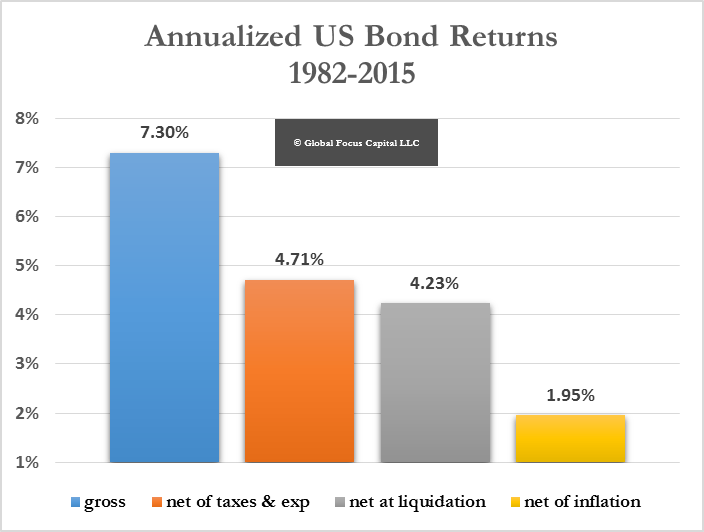 Some of our readers, however, remembered empirical work we had done a number of years back using broad US stock and bond market returns. We decided to update our previous research on the effect of taxes, fees and inflation on the real return to investors. Our methodology is simple. By necessity we employ some simplifying assumptions regarding fees and taxes. 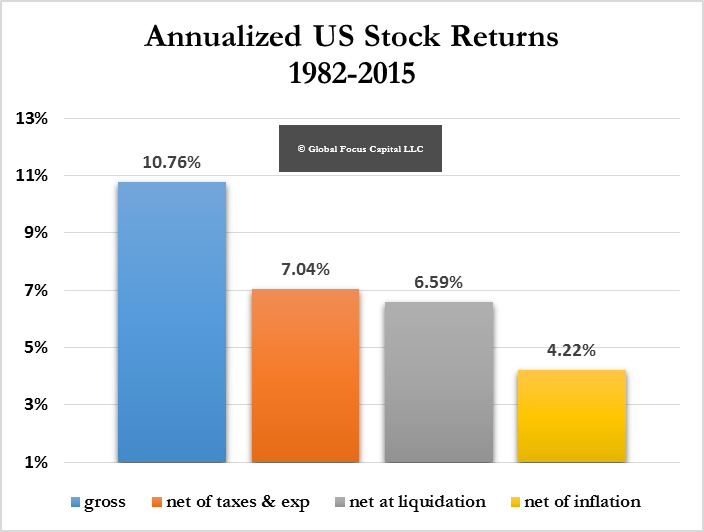 We use S&P 500 and US Government Ten-Year Note returns from the end of 1982 to the end of 2015. The results are eye opening and a timely reminder of the drag on investment returns. A lot of investors would be surprised to see the extent of this drag on their portfolios but in the real world the results may actually turn out to be even worse. Why? For one many investors pay high fees on their portfolios and ignore the tax efficiency of their strategies. Management fees on portfolios should be scrutinized for value add. Portfolio management has a cost. Index strategies are now available on most market segments in equity and fixed income markets at low cost but the combination of strategies and overall asset allocation still needs to be managed. Jack Bogle has been talking about the importance of controlling fees for years and investors as a group may have become recently more fee sensitive especially as the realization sinks in that we are most likely going to be living in a low return environment for the next decade. Paying high fees in a low return environment would certainly impair wealth accumulation targets. Paying fees commensurate with value add should be the goal of investors. 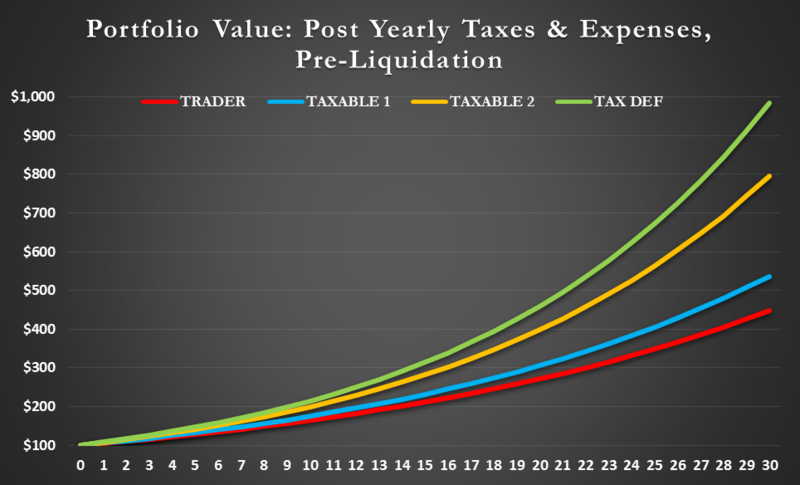 As Benjamin Franklin once said, taxes are as certain as death and as such the best that one can do is minimize the tax bite of investment strategies. Tax loss harvesting, low portfolio turnover, proper strategy selection, and legal deferment of taxable events are elements of a coherent well-designed tax minimization strategy. Finally, a huge drag on net real returns has been the loss of purchasing power. While inflation in recent years has been below historical norms the loss of purchasing power can best be thought of as an almost invisible downward pull on wealth creation efforts. Not all investment strategies behave in the same manner in the face of inflationary forces. Properly aligning investment strategies to the expected inflationary environment is an important component of minimizing the deleterious effects of a loss of purchasing power. Thinking about taxes implications for your investments often plays second fiddle in fast moving capital markets and for a large number of investors – pension funds and endowments/foundations the issue is moot given their tax exempt status. But for many investor be they already wealthy or diligently saving for retirement on their own the issue of taxes is incredibly important. Proper tax management can dramatically alter financial outcomes especially over long periods of time. Tax management can be complicated and should encompass the full financial and human capital picture and goals of the household or multi-generational family entity. Investments are one aspect of this view but properly evaluating the tax implications of different investment strategies is an important component to the long-term success of an entity’s financial plan. While tax structure and rules vary across geographic domiciles (across countries but also by states ) there are generically speaking two types of taxes that subtract from investor returns – taxes on periodic income received (dividends and coupons) and taxes paid upon the sale of a security. We resort to evaluating four different hypothetical strategies using the theory of tax management as outlined in Chincarini and Kim (Journal of Portfolio Management, Fall 2001). The wealth path of the four strategies that we evaluate for tax implications are shown to the left. All strategies assume an annual gross return of 8% and a management fee of 1% per year. The strategies vary by the type of trading incurred. The advantage of the more tax efficient strategies for creating wealth for investors are clear especially as one extends the holding period. Tax efficient strategies compound at a higher rate because of a smaller proportion of gains paid out as short-term taxes and the deferral of trading events leading to fewer taxable consequences. Effective tax management requires an integrated approach to portfolio construction and trading that recognizes the potential returns, risks and tax implications of a strategy. Simply reducing turnover or matching winning with losing positions once a year yields some gains but leaves a significant portion of the potential tax alpha on the table. Tax aware optimization techniques while complicated on the surface are commercially available but require customization to account for individual circumstances. In many instances such programs create voluntary losses to offset current investment gains and the more sophisticated applications encompass security positions across different asset classes. It is also very important to properly account for the intended final disposition of investment assets. Finally, we would remiss to not point out that tax policy is not only highly specific to geographic areas (say countries and states) but also subject to significant rule changes over time. As an active manager one of the toughest psychological tasks is to invest for the long-term but have to deal with the daily noise and chatter of the markets. The unrealistic expectation of having superior performance over all measurable holding periods leads to behavior often inconsistent with the goal of prudent long-term capital accumulation. Given the volatility of capital markets a lot can happen over the short-term that over time gets washed away and becomes a mere blip on the radar. Conversely, other things that in the hustle and bustle of the markets seem minor turn out to be much more impactful over the long-term. Empirical research shows that returns typically are more volatile in the short-term than warranted by changing fundamentals. The net result is a lot of noise that dissipates once investors take a longer term view. Taking a Step Back. 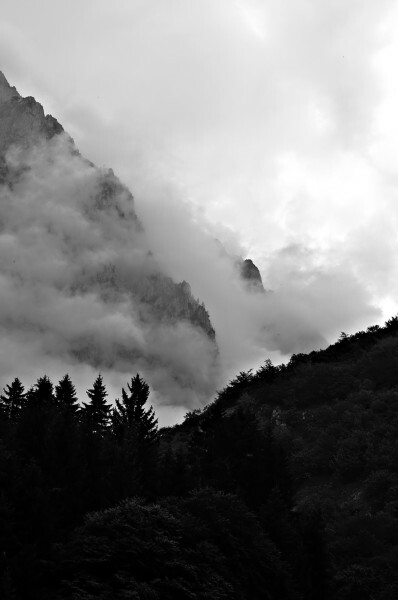 In recent years we have started thinking that stepping back a bit and watching the whole landscape unfold perhaps gives us a better sense of what really matters. As archaic as this may sound to a high frequency trader in our research we have started focusing more on looking at company and capital market fundamentals over longer time periods. Looking for example at year by year annual company financials gives us a better sense where business fundamentals are going. Same with broad capital market relationships at the asset class level. Aggregating annual periods to look at secular trends gives us another way to process information in a manner that may seem old-fashioned but that hopefully removes some of the noise. Shifting our Focus toward Long-Term Performance. We recently put together heat maps of annual performance for a variety of capital market breakdowns. We looked across the major asset classes as well as within each asset class. The results were revealing in each case. We found a lot of surprises especially when looking at cumulative returns over the last ten years! In this note I will share the heat map for the ten major asset classes used in our asset allocation strategies. The returns for 2016 are as of January 22. All returns are in US dollars and correspond to commonly used indices. Lots of variability from year to year – this we expected. After all this is the point of creating a heat map. We did not see a lot of relative mean reversion over one or two calendar years. Again this was expected given the strong empirical evidence that momentum persists for up to three years. We did not see a lot of “going from worst to best” or vice versa. Not all higher risk categories outperformed lower risk assets – this we expected given the hits suffered by equity-oriented assets during the Financial Crisis. For example, US bonds have out-performed international equity investments over the last ten years. Needless to say this was achieved with much lower volatility. US stocks had below average ten-year returns. The annualized return on US Large Caps (S&P 500) was 7.7%, more than 2% below historical averages. US Bonds (Barclay Aggregate) also had below average returns compared to history. A big surprise was the extremely poor performance of commodities (COM) – down 48% over the last ten years. For most investors the promise of uncorrelated returns to the stock market has come at a very high price. Bye-bye commodity super-cycle! I was also surprised by the 2X out-performance of US stocks compared to international equity indices. Some was due to currency but not all. 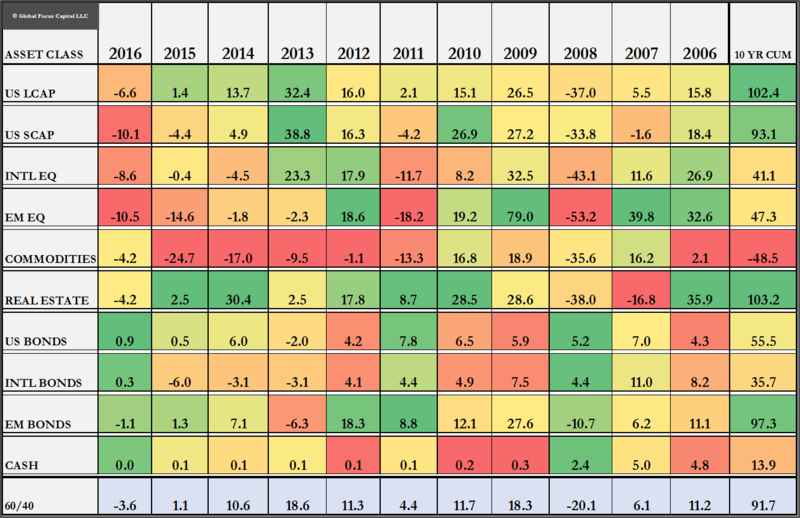 There were major geographic performance differences over the last ten years. US REITS (RE) edged out US large cap stocks by a slight margin over the last ten years. We expected a larger margin of out-performance but we had forgotten that in 2007 REITS were a precursor to what would happen during the Financial Crisis. Emerging Market Debt proved to be a revealing surprise with a 97% total return. Pretty close to US equity market returns and vastly superior to international equities. Much lower volatility too. The 91.7% return to the 60% S&P 500/40% Barclay Aggregate portfolio. The balanced portfolio lagged the S&P 500 by only 0.59% on an annualized basis but with much lower short-term volatility. Not bad for such a simple portfolio. The short-term noise in the capital markets can obfuscate long-term secular changes as well as disproportionally focus the mind on events that over the long-term have little to no significance. Expect lots of variability from year to year in terms of performance but over longer-term periods asset values will converge toward the fundamental drivers of return – income generation, growth and valuation. To reinforce the previous point, a lot of capital market volatility is just noise and should be ignored unless there is a change to fundamentals. Effectively distinguishing noise from fundamental signal is the key goal of capital market research. Capital markets are always evolving but the fundamental drivers of return and associated risk should be the backbone guiding your perspectives.